Much like Alex, who was bemoaning in his review of Live Damage that the NTSC version seemed never to arrive, so have I been with End of Innocence. Ever since this was originally released in Finland and Europe back in September I have eagerly been awaiting news on the NTSC release and finally, this dvd arrived in my mailbox last week. So how is it you ask? In short, as I am almost as big of a fan of Nightwish as I am of Edguy I can tell you that this dvd is incredible. Marco and Tarja seem to have been absent from most of the recording as they have small but still important roles. Actually, even though Marco is on screen less than Tuomas or Jukka, he’s still there and talks about twice as much as Tarja, who is pretty much relegated to being shown at concerts or saying one or two words here and there. This was something though that I didn’t even notice until the dvd was over, I was riveted by the interview and footage too much to even care, which speaks to the strength of this dvd in itself. On the serious side of things, Tuomas is very, very open about his opinions on all things Nightwish. From the way he describes the albums Wishmaster and Century Child, it almost seems like he doesn’t like them by saying that they don’t have that feeling, that innocence anymore. He makes them out to be more of a labor of necessity than love as was the case with Angels Fall First and Oceanborn. At the climax of the documentary, there is also a very surprising shock to the fans about what could have, or could have not been regarding the bands status. I’ll leave that one for you to discover. Extras on this mammoth dvd include two music videos, one for Over the Hills and Far Away and one for End of All Hope. Over the Hills… is a professionally shot clip that features the band performing on the steps of an amphitheatre, some sword fighting, and Tarja walking through a cave with a torch. Ok, so it doesn’t make much sense, but it’s still fun to watch and isn’t embarrassing to show other people unlike certain Italian Symphonic Metal bands videos whose guitarist is one snip away from a mullet. End of All Hope is a montage of festival clips and more weird happenings, such as people rising out of graves and having a vampire chick assault them while a priest and some guy try to bring down the head bloodsucker. A little silly, yes, but still miles away from swordfights with shimmering purple blobs. I’m curious though as to why the clip for Bless the Child isn’t included. The two segments of concert clips include a show in Norway with a “setlist” of Sleeping Sun, Wildchild, Beauty and the Beast, She is My Sin, and Slaying the Dreamer. My personal favorite songs from here are Wildchild, Beauty and the Beast, and She is My Sin. Marco handles the male duties quite admirably in Beauty and the Beast and the W.A.S.P. cover is killer to hear done in Nightwish fashion. No, Tarja doesn’t sing this one, its Marco all the way, and truth be told I would rather have had the guys play this one at Prog Power IV than Crazy Train. Summer Breeze Festival songs are End of All Hope, Dead to the World, 10th Man Down, Slaying the Dreamer, Over the Hills and Far Away, and Sleeping Sun. Another spirited live performance in broad daylight by the crew. As a bonus on the limited versions of the dvd there is an audio cd included that contains the songs from Summer Breeze as well as two extras, Kinslayer and Come Cover Me. It’s a little odd to hear Over the Hills… in the middle of the “set” since it’s the bands encore number but other than that, and the fact that I would have liked the whole show I don’t have any other complaints, hell it’s a freebie anyways. 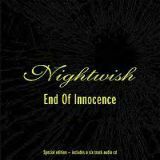 All in all, End of Innocence is a must have release for die hard fans of Nightwish. You will not be bored for one moment in this huge massive set and will come away with the feeling that you understand the band, especially Tuomas a lot more than when you went in there. If I have a couple of complaints one would simply be that Ever Dream is not on one of the live performances, although there is a good amount of footage of Marco laying down his bass tracks so I guess this is a “half” complaint. The other complaint I would have is that even though this was not supposed to be a concert dvd, I wish that instead of having two half shows, we could have had either the entire Norway show or the entire Summer Breeze Festival. That’s it, if all I have to complain about is the absence of one song and wanting more songs then I’d say that’s a fair deal. Not only is End of Innocence a killer dvd for the fans, it is a lesson to other bands out there as well on how to make one monster of a package.